I was fascinated by this photo taken at the end of the 19th Century in Northern Holland. 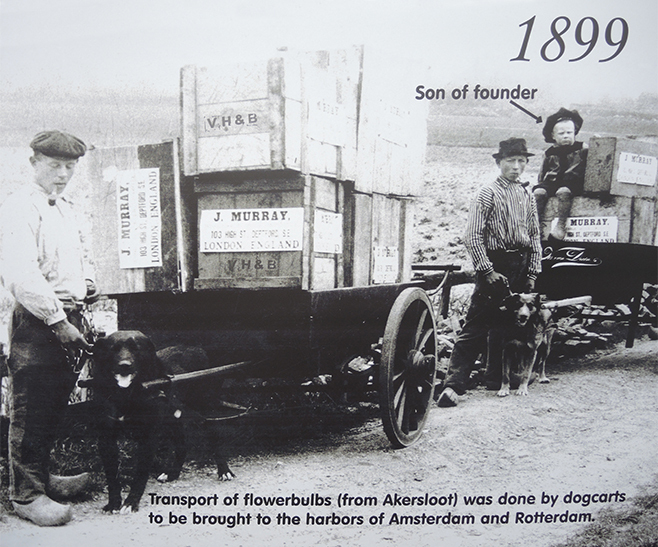 After the bulbs were harvested from the fertile polders, they were packed and transported by men and dog carts who walked to the nearby ports, including Amsterdam and Rotterdam. Clogs and pipes were popular too. These crates were destined to J. Murray (seed merchants) in London. The bulb trade continues today and across the world (China is the fastest growing importer), although Floridata figures showed an 11% drop in Dutch plant and flower exports to the UK in June 2017, a year on from the Brexit vote. Fear not! Dale & Heybrook will carry on importing as normal to create the most beautiful gardens using best quality plants at best prices for our clients.